The Redefining Wealth Podcast community believes that wealth is about more than money and material possessions; it’s actually about well-being. 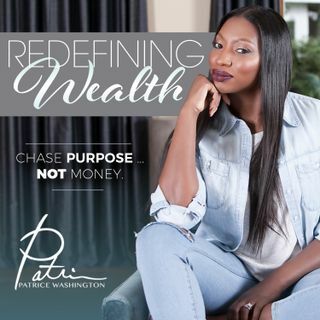 Each week, award-winning personal finance author, international speaker, media personality and your BFF in your head, Patrice Washington, shares solo insights or enlightening guest interviews that influence the masses to live their life’s purpose, find fulfillment and earn more without chasing money. In today’s episode, we explore what it means to ask ... Maggiori informazioni for support. What if our irrational fears are making us irresponsible stewards of the gifts we’ve been blessed with? We can’t take the contributions we’re making to our communities for granted. We have to be bold and ask for what we need. Even if the answer is “no,” at least you asked. This year, I want to be an example of what it looks like to push past the “what ifs” and stop being selective with my surrender. As I’ve learned in the last few months, people want to help, but we’re the ones making up the stories about what that means about us. It’s not them. Special Thanks to those listeners who said “YES!” to being Founding Purpose Chasers on my Patreon Page or those who made a one-time donation so I could bless someone else.